TMG Partners and KKR Acquire 1221 City Center in Downtown Oakland | KKR & Co. Inc.
SAN FRANCISCO/OAKLAND, Calif. & NEW YORK--(BUSINESS WIRE)--Dec. 3, 2018-- TMG Partners, one of the Bay Area’s largest mixed-use property developers, and KKR, a leading global investment firm, announced today the purchase of 1221 City Center in Downtown Oakland, California. The purchase is the second transaction by TMG and KKR in Oakland this year, following the purchase of 1330 Broadway in Oakland in July. The project is a 24-story, 522,000-square-foot office building and is located at the intersection of Broadway and 12th Street. The building is one of three in the Bay Area that enjoys access to BART via a direct entrance to the 12thStreet Station through the building lobby. KKR is making the investment through its Real Estate Partners Americas II Fund. 1221 City Center is 99% leased. Existing tenants include Clorox, Union Bank, Stanford Health Care, Wells Fargo Bank and Parsons Brinkerhoff. The building has previously achieved a LEED Platinum rating by the US Green Building Council and features panoramic Oakland skyline and Bay views, onsite retail amenities and ample parking, as well as bike lockers and showers. TMG, which recently celebrated its 33 1/3 anniversary, has been increasingly active in the Oakland office market. The purchase of 1221 City Center represents TMG’s fourth transaction in Oakland. 1330 Broadway was TMG’s first Oakland redevelopment. Last year, the firm also acquired 2201 Broadway, an eight-story 198,000-square-foot office building in Uptown Oakland. 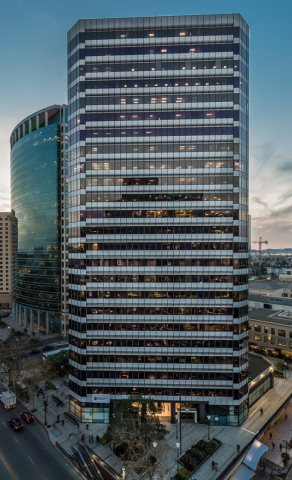 Currently, the firm is also entitling an approximately 750,000-square-foot office and retail tower at the intersection of Grand Avenue and Telegraph Avenue. TMG Partners, founded in 1984 and headquartered in San Francisco, is a full-service real estate development and management company. TMG has developed more than 25 million square feet of property throughout the San Francisco Bay Area, including San Francisco, San Jose, Oakland, Palo Alto, San Bruno, Emeryville, and Marin City. One of the most active developers in this area, the company has developed a variety of office, retail, residential and industrial properties, ranging from office campus and multi-story properties in urban, infill locations to mixed-use retail and single-story suburban buildings. For detailed information, visit www.tmgpartners.com.